The warm colors are the tropical communities of the region: Sonoran Desert (yellow), Thornscrub (orange), and Tropical Deciduous Forest (red). Click on map for larger version. The Arizona-Sonora Desert Museum has an enduring interest in the Tropical Deciduous Forest (aka Tropical Dry Forest or simply TDF) of southern Sonora. Here we present the natural history of tropical southern Sonora to promote and facilitate research and conservation activities in that region. The section on research opportunities and the plant names database are specifically addressed to that end. Many of the species accounts are sketchy; they are intended mainly to serve as pictorial supplements to existing scientific literature on the region. 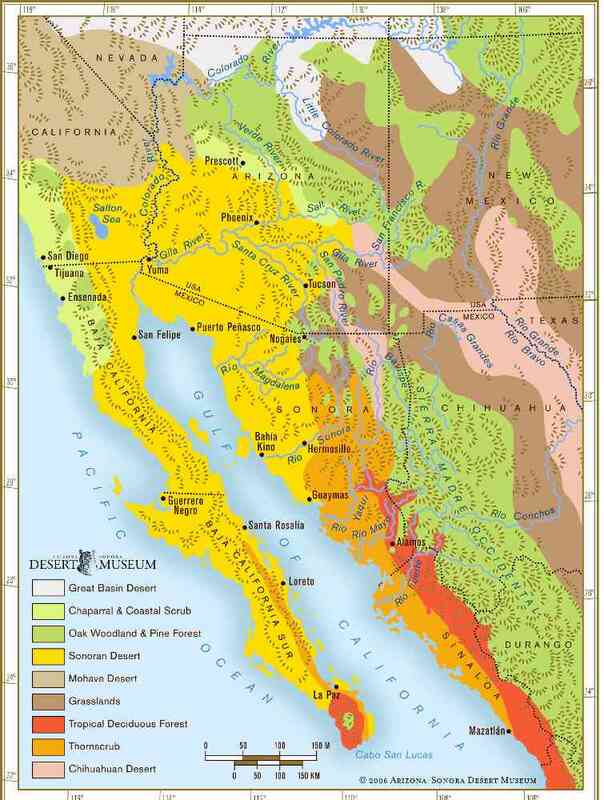 The modern climatic and biotic regimes of North America were established by the uplifts of the Sierra Madre Occidental and Rocky Mountains in the Oligocene and Miocene. The uplift of the Sierra Madre restricted tropical vegetation to lowland bands along the coasts of the continent. 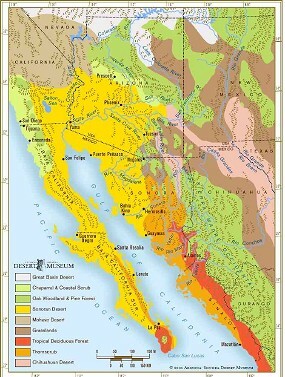 Northwest of the Sierra Madre, tropical vegetation was isolated in the modern Sonoran Desert Region from Sinaloa to California. The nearest relatives of important Sonoran Desert plants including the cardon or sahueso (Pachycereus pringlei), cochal (Myrtillocactus cochal), saguaro (Carnegiea gigantea), and senita (P. schottii) are far to the southeast in south-central Mexico. Understanding the tropical dry forest and thornscrub of Sonora facilitates comprehending the ecology of the Sonoran Desert. The Desert Museum has been actively involved in research in southern Sonora's tropics since the 1960s. A great deal of work has been done in eastern Sonora, in the Municipio of Yecora. Our current focus and subject of this website is in the vicinity of Alamos in southern Sonora. 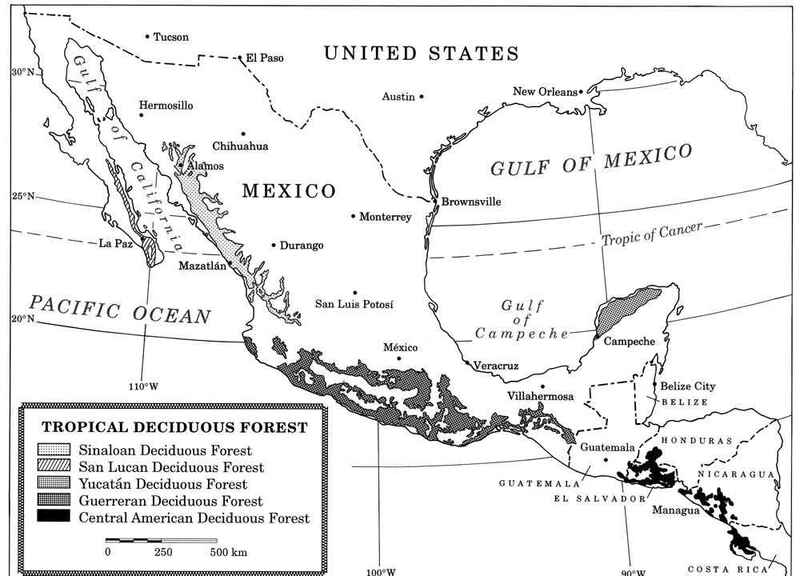 Distribution of tropical deciduous forest in North America. Click map to see a larger image. 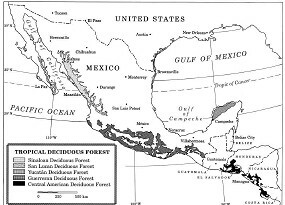 Tropical deciduous forest in the New World occurs in a nearly continuous ribbon along the coast from southern Sonora south to Panama with an average width of only 50 km (Krizman 1972, Gentry 1995). There are also major areas of this community in South America, including some of the same plant and animal species that occur in Sonora. Throughout this area, dry tropical forests have been heavily impacted by human activities. Pre-Columbian and historic cultural impacts on tropical forests are very difficult to evaluate. To us the tropical deciduous forests of Sonora appear to have been impacted much less than those in more heavily populated areas to the south. The most extensive areas of mature tropical deciduous forests remaining today are likely in Sonora. The Desert Museum is working to preserve the best of what's left. Southern Sonora is defined here as that part of the state located south of the latitude of Yécora (28 23'30"N). This includes all of the Tropical Deciduous Forest in the state. Most of the research reported here was conducted in the vicinity of Alamos in the extreme southeastern corner of Sonora, and along Mexcio Highway 16 from Hermosillo to Yécora. The Desert Museum has conducted numerous research projects in eastern Sonora along a transect from Hermosillo to Yécora, including a large part of the Migratory Pollinators Program. Our current work is centered around the Spanish colonial town of Alamos near the southern tip of Sonora. Alamos offers numerous amenities to support biological research, environmental education, tropical conservation, and ecotourism. Nomenclature: The species accounts do not include synonyms or authors unless there has been a recent change or disagreement on the name of a taxon. Refer to the plant names database for synonyms and authors of plants.